The patient is well, and the hospital is planning to continue the procedure in other patients. On February 28, 2016 we reported that surgeons in the United States completed the first uterus transplant in the nation. Ultimately, this procedure could give hope to a number of individuals who have issues with their reproductive health. Unfortunately, new reports just confirmed that the transplant was not successful. Yesterday, surgeons behind the work at the Cleveland Clinic reported that the organ was removed on Tuesday (3/8/16). The patient is currently being examined by pathologists in order to determine what went wrong to cause the organ to die suddenly. “We are saddened to share that our patient, Lindsey, recently experienced a sudden complication that led to the removal of her transplanted uterus,” they stated in the release. Ultimately, this procedure was just the first of 10 that the hospital has planned. Despite the setback, the doctors plan to move forward with their work. “The study, which has been planned to include 10 women, is still ongoing with a commitment to the advancement of medical research to provide an additional option for women and their families,” the Cleveland Clinic said. You can read below for our previous coverage of this story. 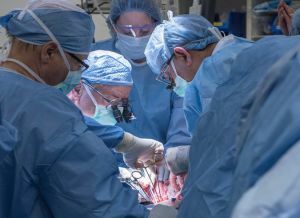 For the first time in the United States, surgeons from the Cleveland Clinic were able to successfully complete a breakthrough in surgery: A uterus transplant. The surgery took nine grueling hours in the operating room and was performed on a 26 year old woman whose identity is being witheld in the interest of privacy, but the clinic assures the public that the recipient of the uterus (which came from a deceased organ donor) is in stable condition. Heading the team is Dr. Andreas G. Tzakis, whose expertise in transplant surgery is supported by having performed transplants with over 4000 kidney, liver, and various other abdominal organs. To prepare for the uterus transplant, Tzakis traveled to Sweden to work with the surgeons from the University of Gothenburg (the only other hospital who has successfully performed the same procedure), where previous uterus transplants were conducted, this time from living donors. Thus far, four of the transplanted women have conceived and delivered healthy (although pre-mature) babies. The transplant is intended to give women who were born without a uterus, or who had them surgically removed, a chance to bear children and give birth. Currently, there are an estimated 50,000 women in the US who could be potential candidates for the procedure. It takes about a year before the recipient of the uterus transplant can attempt to get pregnant, so that it gives her enough time to heal and adjust the medication to prevent organ rejection. In vitro fertilization will be required to become pregnant, using eggs that the woman will have removed prior to the transplant and the partner’s sperm, kept in storage. Once ready, the embryos will then be transferred into the newly transplanted uterus. It should be noted that the transplant is not designed to be permanent. The uterus should be removed after the recipient gives birth (maybe after one or two babies) so that she can also stop taking medications preventing organ rejection. The Cleveland hospital’s ethics panel has already given the surgeons and researchers behind the procedure permission to conduct the transplant 10 times as an experiment. From there, the panel will then study the feasibility of the procedure and whether it will be offered as a standard surgical procedure in the clinic.